Here is another tunic dress from The Tunic Bible by Sarah Gunn and Julie Starr. I loved my first dress I made from this pattern so I had to make another. I originally intended to make this dress with a neckline totally different than my first dress, but in the end I decided to go with the wide-split placket and angled collar again because I thought it would show off the trim best. I made the dress in an XS. The directions state to size-down if using a knit, but XS is the smallest in the size range so I just took in as I needed to get the fit right. The fabric is the Leggero ponte by Telio. It is a rayon blend light-to-medium ponte with great recovery. I purchased it from Fabric.com last year, but they are currently sold out. I found the silver sari lace trim on Etsy. If you are looking for something similar, try searching for “sari trim” or “sari lace”. There are literally thousands of beautiful embroidered and crocheted trims in this category and most are very affordable. I did notice that the trim shrank significantly when exposed to steam. I’m not sure if most crocheted metallic trims do this, but it is something to keep in mind. Unfortunately, I noticed this after I had applied the trim to the collar and before I sewed the collar on. So the collar didn’t fit right in the neckline due to the shrinkage. It also created some drag lines from the high shoulder point to the armpit, but I still love the dress. I used the same crochet trim at the neckline and hem of the dress, but I removed the scalloped side of the trim to get a different look at the bottom of the dress. You can see me unravel the trim on my instagram post here. I love that I get a cohesive look without buying two different trims! To get the perfect placement of the trim at the bottom of the dress, I marked 3/8″ away from the edge of the fabric at the hem using chalk and hand basted the trim to the dress. I then pressed the trim to get perfectly crisp mitered corners before I sewed the trim down on either side using a straight stitch on my machine. I have plans to make another dress from this pattern in linen, hopefully I can get that done by the end of the summer. 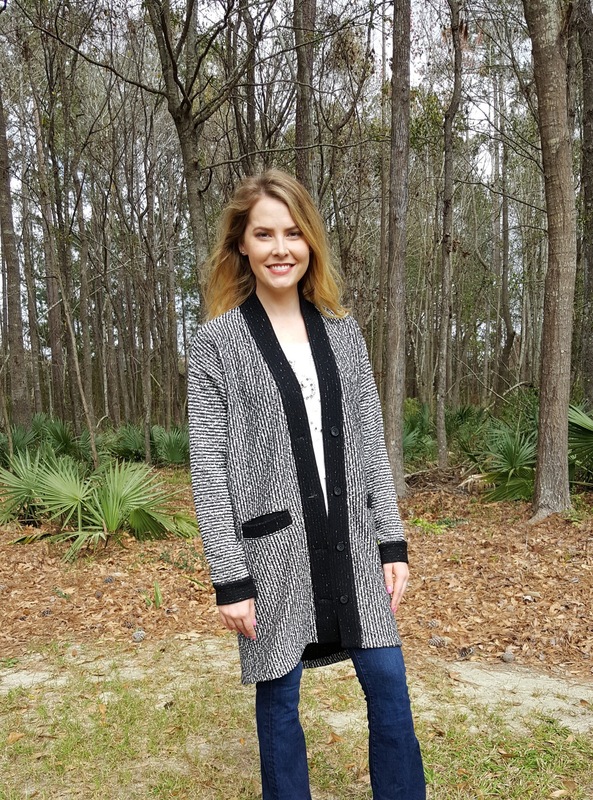 The Esme Cardigan is a fun, fashion-forward cardigan pattern perfect for medium or heavyweight knit fabrics with minimal stretch. 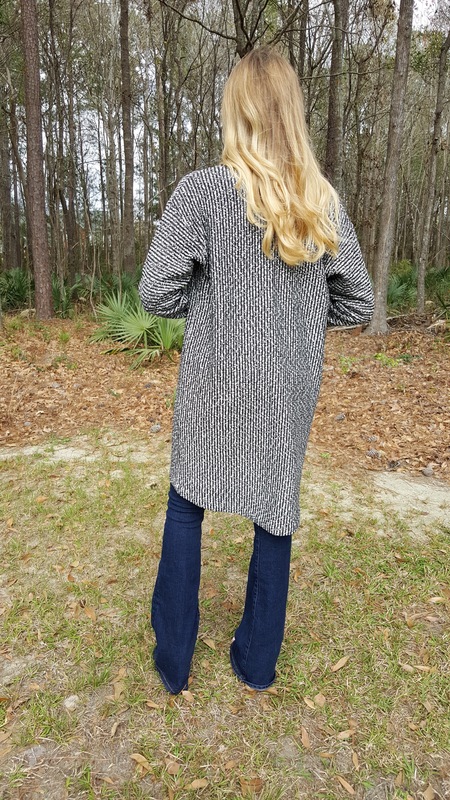 The oversized look and dropped shoulder seams are right on-trend, and this would be a great project for beginners! 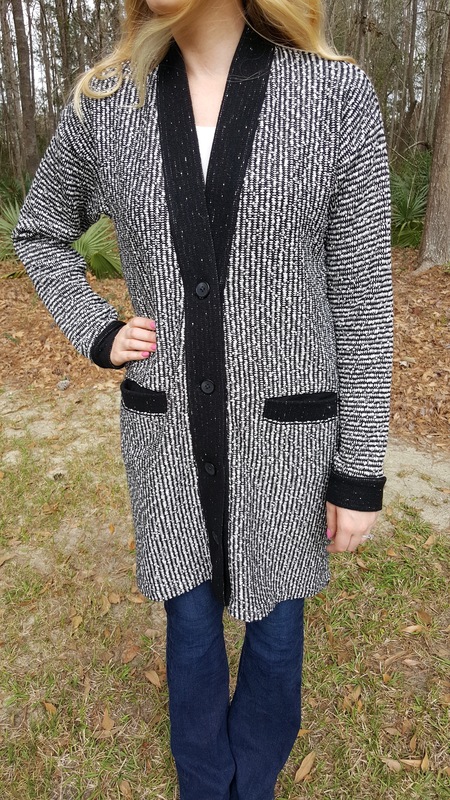 The cardigan is made with a black and white metallic boucle knit from Stylish Fabric. Sadly, this fabric is no longer available on their website. I think this cardigan would look best sewn with knits that look more dressy as opposed to casual. Heavily textured fabrics, wool, or wool blend knits would be great options. However, an Esme sewn in a casual cotton sweatshirt jersey or cotton French terry might look more like your grandma’s house coat and less like a chic cardigan. FYI, B&J Fabrics’ website has a huge selection of wool knits and textured novelty knits right now. They are perfect for the Esme. Stylish Fabric still has a few heavier knits in stock too. My measurements indicated I was a size small by Named’s sizing standards, but I decided to cut out the extra small based on the finished garment measurements. This pattern has a lot of ease! I made several small changes to this pattern. I shortened the length to hit just above the knee, and also made a slight high-low hem. The back is 2.5 inches longer than the front. Also, I eliminated the seam that originally joined the upper and lower front pieces, and I changed the pocket style from in-seam pockets to welt pockets. This particular Named PDF pattern has seam allowance and stitching lines marked which made pattern hacking easy. For the welts, placket and cuffs, I used the wrong side of the fabric, and I love how it turned out! I wish all fabric had a beautiful wrong side! My pockets are two inches narrower than the original in-seam pockets. I was able to use the same pattern piece for the pocket bag, but I trimmed the sides down to match the new pocket width. 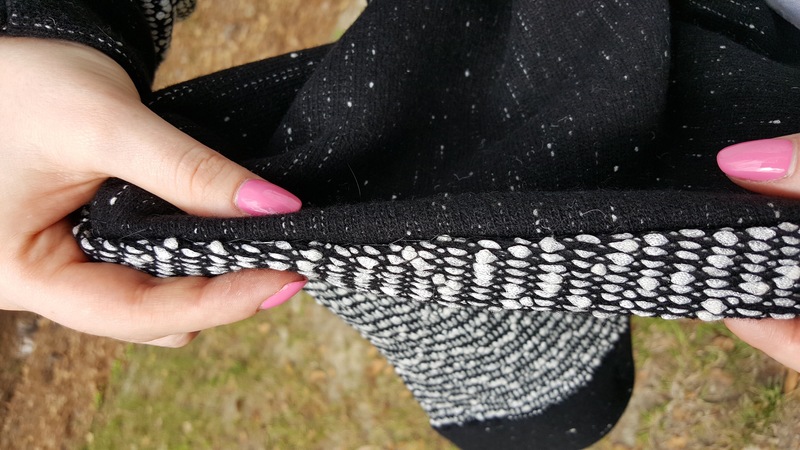 Sewing welt pockets in knits uses the same process as inserting welt pockets in woven fabric; just make sure you use interfacing made specifically for knits like a fusible tricot! Use a pressing tool, a clapper, to get a crisp, folded edge on the welt. I hemmed the cardigan by hand using a catch stitch. It stretches nicely with the knit. I used corded button holes on this knit for and added stability and because they look amazing on thick fabric. 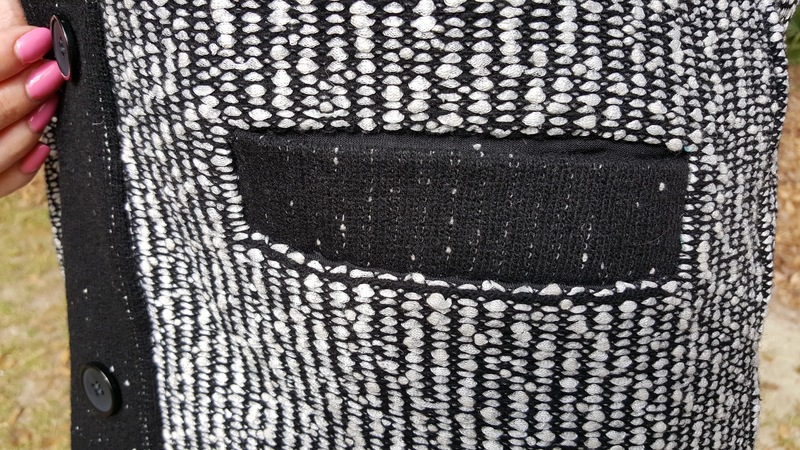 Larger buttonholes tend to appear wavy or saggy on knits after they are cut open even with the appropriate interfacing. The cording also gives the buttonhole more of a 3D look as some buttonhole stitching gets lost in chunky knits. Come back next week for a tutorial on corded buttonholes! Until then, I’ll be enjoying this early Charleston spring weather.